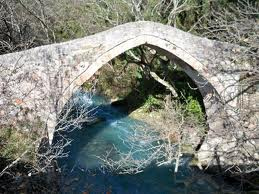 If you’re ever in Karytaina worth visiting is the bridge that overlooks the river Alpheus. The bridge of Karytaina, one of the oldest bridges in our country has a length of 50 meters and consists of five unequal arcs. Just down the road you will see pop up the church of Panagia. The bridge was built to unite the Castle Karytaina with Messinia. The architecture of many highly distinguished Frankish elements as built in the 13th century by the Franks. The 1441 restored by Raul Manuel the Melik as testified by a wall inscription. In engravings of 1830 reflect changes such toned saddle over the middle and bigger arc. Thus was repaired and early 19th century. Today, there are the 3 of the 5 arcs, and the party has collapsed has been replaced by a wooden bridge. Directly above during the ’50s built a new bridge of concrete and unfortunately one can not distinguish the old bridge. If you wish to visit should follow the dirt road on the right. The bridge Karitaina depicted on the old banknote 5,000 thousand drachmas. Lousios Gorge is one of the main attractions of Arcadia. It is a place of highly charged historical and religious, an area of ​​rare and majestic natural beauty, one of the most impressive gorges in Greece. 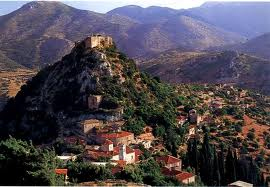 It is also known as the Holy Mountain of the Peloponnese, because of the many historic monasteries, hermitages and churches. The name of the river Lousios owes Mythology. According to this and as mentioned by Pausanias, the newborn Zeus bathed hidden from Saturn to the springs of the river (Sources of the Immortals) by Nymphs Neda, Agno and Theisoa. Later renamed Gortynia River from the city of Ancient Gortyn. Pausanias saw even Lousios like the coldest of the famous river in the world. Apart from its natural beauty, the Gorge is full of Monasteries carved on the rocks, churches, hermitages hermitages, old bridges and abandoned mills. In the Gorge are: The Monastery of Timiou Prodromou, Monastery Philosophou, Aimialon Monastery, the Monastery Kalami-Atsicholos and Agios Andreas Gortinos. The crossing of the Gorge can be started from Dimitsana the headboard of St. John, the Baptist Monastery, the Modern and Ancient Gortyn. A typical path starts at the new Monastery Philosopou, and following the trail passes by the old Monastery of Philosopou, then descending on Lucio river, then climbs to the Monastery of Baptist, and finally ends in Ancient Gortyn (duration 2 hours). After a while, Lousios River flows into the Alpheus, where we continue rafting passing under stone bridges to stop just before the gorge of Alpheus the impressive stone bridge over the Cuckoo.